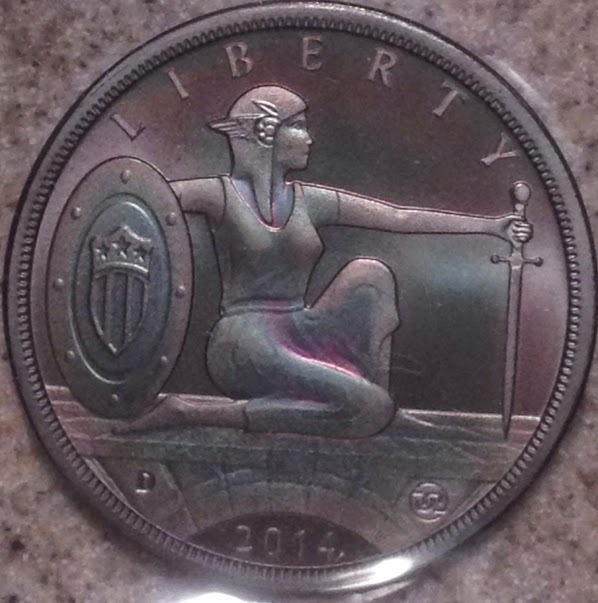 Tony Lawrence's Coins & Stuff: Alternative currency, counterfeit, fraud or numismatic item? 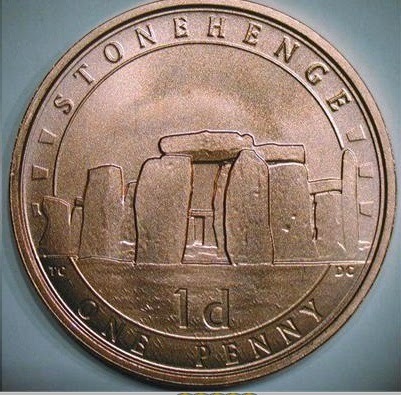 Alternative currency, counterfeit, fraud or numismatic item? The coin shown below is one of D. Carr's Moonlight Mint "Alternate Currencies". 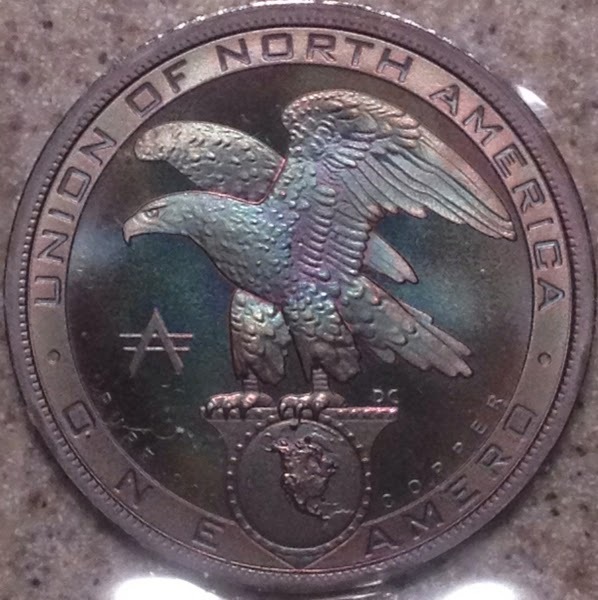 D. Carr has been making these "Amero" coins since 2007 as concept pieces for a Mexico/Canada/U.S. monetary union. That union is extremely unlikely (mostly because there is no benefit to the United States), but that hasn't stopped conspiracy theorists thinking it will happen. 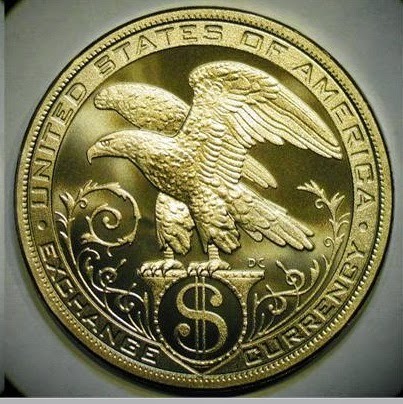 For an equal period of time, D.Carr has also been making "World Trade Coins", mostly announcing themselves as "Trade Dollars" or "Exchange Currency", but with some seeming to skate even closer to risking counterfeit charges. "Whoever, except as authorized by law, makes or utters or passes, or attempts to utter or pass, any coins of gold or silver or other metal, or alloys of metals, intended for use as current money, whether in the resemblance of coins of the United States or of foreign countries, or of original design, shall be fined under this title  or imprisoned not more than five years, or both." any false or fictitious instrument, document, or other item appearing, representing, purporting, or contriving through scheme or artifice, to be an actual security or other financial instrument issued under the authority of the United States, a foreign government, a State or other political subdivision of the United States, or an organization, shall be guilty of a class B felony. Bernard von NotHaus ran afoul of those laws with his "Liberty Dollar". Why hasn't D. Carr experienced the same problem? The "intent to defraud" and "intended for use as current money" might have a lot to do with it. There's another firm openly selling coins which look very much like the von NotHaus coins - they are still in business. They have made some changes in hopes of avoiding a similar result. Another reason the Moonlight Mint coins may escape prosecution is their very low mintage and relatively high issue price. It's hard to imagine a jury seriously considering that a dollar sized coin with a mintage of under 100 that was sold for $30 to $80 is "intended for use as current money". Still, it's always possible that some prosecutor will try. Satirical pieces like this FBI Raids Chuck E. Cheese For “Undermining U.S. Currency” might turn out to be not so farcical. Amusingly, such publicity for D. Carr would probably increase the value of the other pieces that Moonlight mint has produced! I see it as private issued exonumia, it seems they all have a couple things in common. relative low mintage, advertised as rare and a price tag that's way to high. People are lured into buying these "rare" coins thinking they have made a guaranteed profit buy. In my opinion it isn't a bad idea that private mints have to make their designs with enough difference compaired to official issues. Some company's are doing just that and are highly popular without grinding the edge of what's legal and what's not. While i'm typing, I have a question about alternative currency. My girlfriend is into native american art, decoration, pretty much everything, since 2011 I buy her the Mesa Grande coinsets, Little information is to be found on these coins. I did found that these are official because the Mesa grande native americans are self-gouverned within a souvereign nation. I hadn't heard of these before today! I just Googled them - they are good looking, at least from the photos. You have to be lucky with their 2011 set, our first had such weak strike on the 1$, half and quarter that we ordered another hoping to recieve a better one. strike was better, but still weaker on the 1$. As of the 2012 set no more problems. When will you be doing another article on this subject? Book Review: Basic Coin Design - is less more?